Paul is a commercial architectural photographer in Birmingham and sometimes dabbles in a little landscape photography when he is allowed out! In the middle months of 2013 I heard rumour of a new book about to break onto the scene, written by a friend I had made very early on in my landscape photography career. Many of you will have read the review of Dav Thomas’ book, With Trees, and you may even be lucky enough to own a copy. The content of the book was simply wonderful, but the presentation and production of the book was something that was interesting in itself; the book represented the first publication by a publisher that styles itself as a producer of “Quality Landscape Photography Books”, and in the months since then, TripleKite Publishing has announced a number of exciting book projects, and I know that more are in the pipeline. 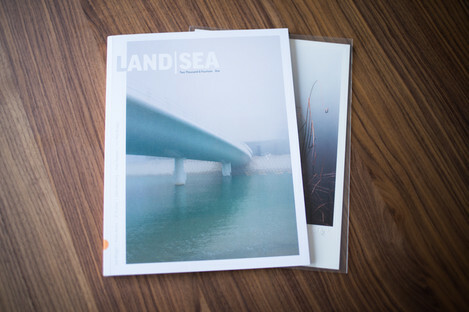 One of the book projects that TripleKite has announced and now produced is the Land|Sea book in collaboration with On Landscape. TripleKite were kind enough to provide me with a copy of the book so that I could review it. So when I arrived back home last week I was delighted to see a discreet packet waiting for me on my doormat. Inside the carefully thought out packaging was the book and also a beautiful print to accompany it, available for a very reasonable extra supplement. This book is an unusual prospect for the reviewer as firstly it contains work by a number of different photographers, and secondly because it is clearly designed to be the first volume in a series, so I feel it is better to discuss the work and the production separately as the production is likely to remain constant for future volumes. The book is very nicely printed, and the variety of papers and printing methods provides a very tactile experience. 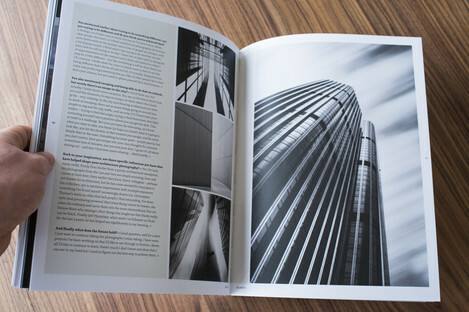 The inside is a combination of very thin paper for text sections and sumptuous matt paper for the images, and combined with the silky matt cover, it gives a feeling of being a high-quality publication. The dimensions and bulk of the book remind me of publications like the British Journal of Photography and in some ways I think that this should be viewed as an overachieving magazine, rather than a book. Land|Sea is something of a compilation album, but I don’t want you to think of it as a Greatest Hits type of affair; they’re trying to do more than that. The collaboration with On Landscape has enabled the publisher to select a small group of photographers that are very different from each other, and that are able to demonstrate high levels of skill and creativity in their own area of the landscape photography spectrum. So perhaps this book is more of an anthology designed to give a flavour of the variety that is out there, rather than something designed to illicit a “Wow!” response. Each of the photographers featured in the book (Joe Wright, Valda Bailey, Al Brydon, Giles McGarry and Finn Hopson) get eight pages in which to show their work, and with each is either a short essay about their method and philosophy or a question and answer session, very reminiscent of On Landscape’s Featured Photographer articles. There’s also a very good essay by Paul Kenny at the end of the book: a discussion piece about the relationship between Landscape, Photography and Art. Whilst an enlightening read that helps us to understand how Paul came to produce the work in the way that he does, I would have perhaps preferred him to write a piece about his views on the work represented in this book. I have spent time photographing with Joe in the past, and I have always marvelled that such quiet and gentle work can come from such a giant of a man. The first image in the main body of the book is a simply stunning image of a pile of rain-soaked Crocosmia, with glistening water droplets and rich, juicy colours. I was so pleased to find this image at the front of the book, welcoming me, warming me and encouraging me to sit down and read the rest of the book in one sitting – not something I’m prone to do. Alongside Joe’s thoughtful prose on the virtues of the British landscape is a pair of literally reflective images that sit well opposite a peaceful, almost monochrome winter woodland scene, before an explosion of colour in the rock studies over the page. 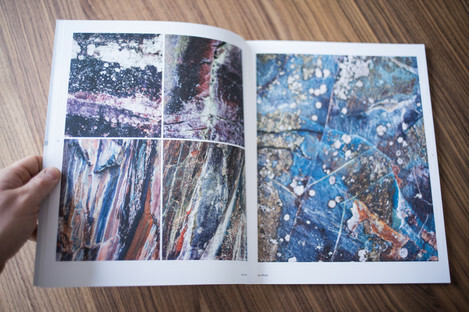 Describing these images as simply rock studies doesn’t do them justice however, as the rich colour relationship between the five is both pleasing and jarring and demonstrates the pre-visualisation of the set as a whole. Joe’s final pages are devoted to a pair of images (my favourites) that show his ability to spot images where others might not, and how he can combine still and dynamic elements to create images that confuse and titillate the senses. I’m looking forward to seeing more of Joe’s work in print in the years to come. I have often felt that amongst arty types, photography is viewed as a poor cousin, a runt of the litter, and not particularly artistically valid. Indeed, on reading a book titled “101 Things to Learn in Art School” recently, I saw an illustration depicting a camera with the title “Always document your work” – the implication being that photography is only for documenting art, and cannot be art in itself. 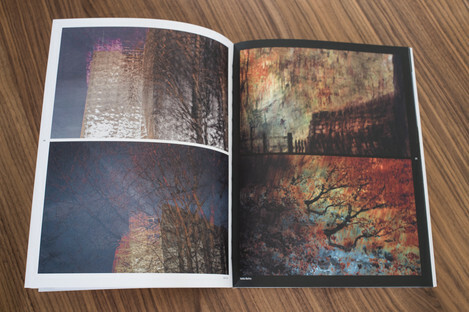 Paul Kenny’s article in this book discusses that photography can be art, and that the subject isn’t important, but other less tangible things are. Valda’s work for me perfectly illustrates how it is possible to use the medium of photography to create “Art”, and I can’t see how it could ever be accused of being merely descriptive and illustrative in the way that photography often is. I find it difficult to describe adequately the images that Valda creates. She makes, in camera, images that in my view aren’t photographs: they are individual artworks created with a camera. I think that photographs in the traditional sense can become art if they are viewed as part of a portfolio that has something to say more than just “this is a pretty picture”. This simply isn’t the case for Valda – each one of these images deserves in my view to be considered as art on it’s own, let alone as part of a portfolio. Her images are rich in colour, lush in tone and are long-lasting because of their confusing nature. I can look at most traditional photographs and know pretty much how they were made, but with Valda’s I mutter with child-like wonder “How on Earth did she do that?” I would be doing her a disservice to try to describe these images to you, so I won’t. But you should definitely check her out. The last ten years in landscape photography has mostly been about big vistas and bright colours, and the mainstream photography press has perpetuated this because it looks superficially appealing on the page. It’s always a relief to me then when I am allowed to look at work that is less colourful, less contrasty and that has less obvious compositional structures. Those images permit me to have more than a “Oooh” reaction; they let me stroke my imaginary beard instead and ponder them. Al’s images are predominantly dark and brooding, they demonstrate careful and well thought out solutions to compositional problems, and there are strong lines of energy movement though largely static structures. The pair of full-page images in the middle of Al’s chapter of the book are particular favourites and complement each other well. I find them inviting and they make me want to explore those places and find my own images too, but not because I want to take the same, but because his images make me believe that there are so many possibilities in those places. The set hangs together well in tone and style, although I’m not convinced all of the images work well with the printing method employed in creating the book. The matt paper on which the images are printed is actually quite reflective and I found that I had to move to the window to get the best out of Al’s darker images. It’s a minor thing indeed though, and I found the imagery and the humour in the accompanying interview particularly enjoyable. Giles is another photographer with whom I have been lucky enough to spend a day over the last couple of years. We went out in the rain around central London and came back with pretty much no images at all, but we spoke about our mutual love and respect for architecture. Architectural photography is my game, and so I take real pleasure in not only the subject matter of Giles’ photography but also the way in which he approaches it – a way completely different to mine. 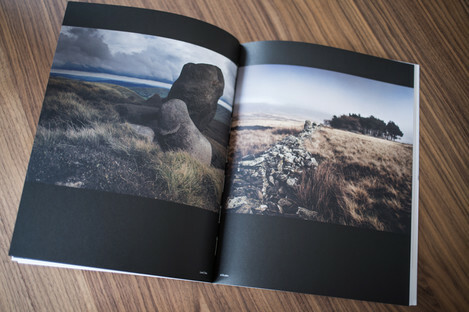 Some may question why a portfolio of architectural photographs is appearing in a book of landscape photography, and they may have a point, but a prospective client of mine hit the nail on the head a few years ago when he said of architectural and landscape photography: “They’re the same thing, right? You’re looking for the same things in the photographs.” In this respect, the artier side of architectural photography should feel right at home alongside images of the landscape. Giles’ love affair with line and texture is evident in this portfolio of images. The techniques he employs in making his images may be quite common these days since the rise of the Big Stopper, but this level of attainment is not at all common. His employment of both high and low key, angular and rounded shapes, smooth and jagged textures give a nicely balanced set that leaves me wanting more. I hope Finn will forgive me for revealing that out of all the photographers featured in this book, he is the only one I hadn’t heard of before. This is I think one of the strengths of the book as a whole: it introduces you to a selection of photographers, different in style, and you probably won’t have heard of them all. One of the difficulties I have with my landscape work is finding the time to get out and make images, and I have noticed that the better landscape photography output usually comes from photographers who make images close to home. This is no accident, as I think real success comes from repeated visits and getting to know an area intimately. Finn is another to add to the list of image-makers who show that regular visits to the same area yield stunning results. 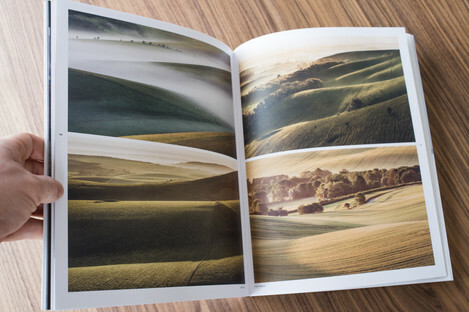 His peaceful images of the South Downs stir emotions in me, and certainly make me wish I lived nearby so I could go for long walks in those places. In my view, a successful image is one that conveys the feelings of the photographer or that makes you imagine what it is like to be in that place. The final spread of Finn’s chapter feels like it should be a montage of images to accompany a great piece of Elgar, a combination designed to make you fall in love with England and its landscape. I feel that all the photographers featured should be proud to be involved in the first volume of hopefully a long series. 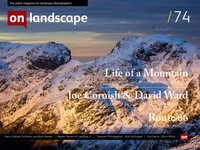 The premise itself is a sound one: create a high quality showcase of skilled landscape photographers, and I hope that the series gets the attention and sales it deserves so that there are more editions to put beside this one on the shelf.